2010 – the year of the Deepwater Horizon oil spill, Wikileaks, and the Arab spring. The year social media really exploded. And the year the altmetrics manifesto was published online. 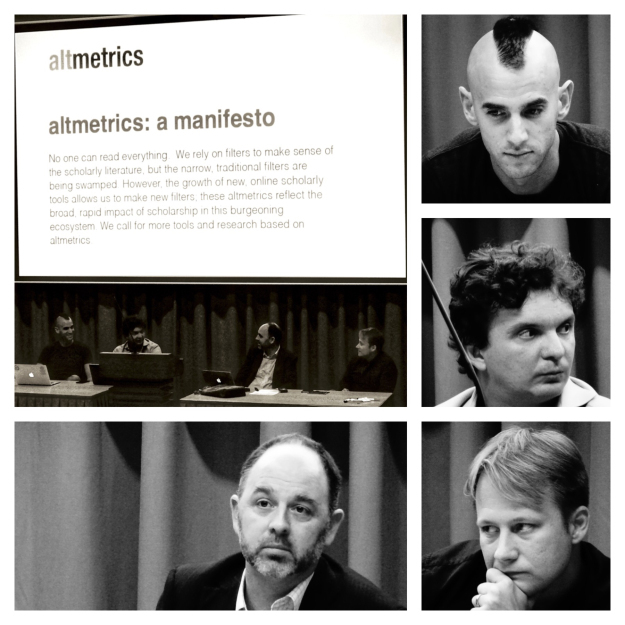 On the occasion of the manifesto’s 5th anniversary there was a huge cake, and the additional treat of having all 4 founders of the manifesto (Jason Priem, Dario Taraborelli, Cameron Neylon and Paul Groth) on stage together for the closing session of the 2:AM Altmetrics Conference. With Jennifer Lin guiding the discussion, they talked about altmetrics’ past, the direction it has taken so far, and their hopes for its future. After some bantering about the dirty secrets surrounding the Manifesto’s inception (Jason and Dario not being quite sure how to shape it: a movement, an organization, a petition, a hashtag? Cameron thinking of it as “something on the web, might be useful to add my name to, probably not going anywhere…”, and Paul making the grand suggestion to publish it on the Scholarly Kitchen), the discussion quickly turned to more serious matters. Asked about the impact altmetrics has had, both for society and scholarship, all four emphasized the community that has evolved around the concept of altmetrics, and all that this community has done. The many grants awarded to develop the application of altmetrics, the companies that have been founded (and in some cases acquired by large players) to provide services, the attention it has garnered from the field of bibliometrics, adding a tremendous amount of expertise and resulting in an explosion in the scientific literature on altmetrics. We are now at the point where people are embarassed to admit they use the impact factor in assessment, and other forms of output measurement are being asked for, e.g. by NIH. This is not solely to the credit of altmetrics, but clearly a lot has changed in these five years. The time might be right for a Kuhnian revolution in the field of scientometrics. However, there was a strong feeling among the founders that altmetrics has not delivered on its promise if it is mainly used as a different way of counting. With people publishing more, and more different types of output, the real importance of altmetrics lies in its potential to filter, connect and tell stories. The data on how people interact with research outputs can be seen as a form of person-centred peer review and, rather than just used as another measurement, could be used for filtering and recommendation of information. This is a concept that was also explored during the hackday preceding the conference. Altmetrics can also show us how information travels, how knowledge travels. A signal made up by a tweet, followed by a Mendeley read and then a citation is different from a Facebook like, a mention in mainstream media and finally, a policy change. Altmetrics can make these signals visible and enable us to look at the network properties of this flow of information, from a much wider perspective than only that of citations. One step in this direction are the Mendeley reader networks presented earlier at the conference. Thus, rather than just changing the way we measure, altmetrics can be used to create knowledge, connect people and bring science forwards. Maybe that’s the real revolution we should be striving for. As Jennifer concluded at the end of the session, the work of the altmetrics founders is not done. Our work as a community is not done.